At Google, we’ve always worked on what’s next. From the beginning of our company, we’ve had goals that frequently exceeded what was possible with current generation technology. We’ve had to invent hardware, software, processes, and even culture to keep up with those ambitions. Now we are taking that same infrastructure that runs Google.com and opening it up to businesses. Our goal is to change the way our customers compute, not just where. Google Cloud Platform customers can focus on developing codes & applications and not to worry about the underlying infrastructure. Google Cloud Platform is holistically designed and built as a network of warehouse-scale computers, rather than a collection of orchestrated, virtual pizza-box components. In this webinar, we will share how cloud computing has evolved over the decades. You will learn about key product offerings and benefits of using GCP to accelerate your business in ever-changing environment. 2. What makes Google Cloud Platform different? 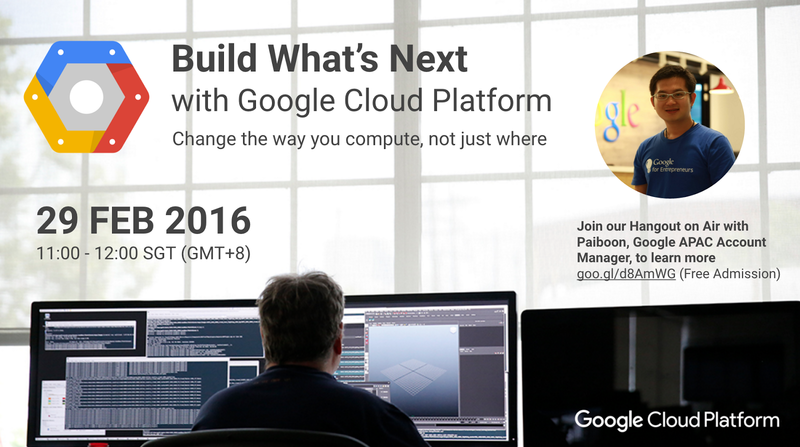 "Interested to learn about Google Cloud Platform and how it can help accelerate your business in ever-changing world? Join us at 11AM SGT (GMT+8) onMonday February 29 for a live hangout! Register now: goo.gl/d8AmWG"